M-Pesa, is a mobile-phone based money transfer service that was started up in Kenya 2007. Since then it’s usage has grown by leaps and bounds. This recent article provides a thorough understanding of how it works and the benefits it provides: 10 Myths About M-PESA: 2014 Update. Fed Chairman, Ben Bernanke is calling for an end to bank reserves. This marks the end of even the pretense that reserves mean anything in today’s banking system, or that there are any effective controls on the abusive issuance of money as debt. Read the full article here. The following is an allegorical story that has been circulating recently. I don’t know who wrote it or where it originally came from, but it does a pretty good job of explaining the scam of the recent banking/finance bailout. –t.h.g. The suppliers of Heidi’s bar had granted her generous payment extensions and had invested their firms’ pension funds in the various BOND securities. They find they are now faced with having to write off her bad debt and with losing over 90% of the presumed value of the bonds. Her wine supplier also claims bankruptcy, closing the doors on a family business that had endured for three generations, her beer supplier is taken over by a competitor, who immediately closes the local plant and lays off 150 workers. I must correct that final statement. The funds required for the bailout are mostly obtained, not from taxes, but are CREATED by the government and the banking system as new massive government debts are monetized. 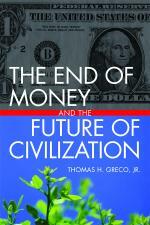 This is the classic inflation of the money supply, i.e., debasement of the currency.–t.h.g. The most amazing thing about this story is that it appeared in Bloomberg, a mainstream financial news service. The second most amazing thing is that it acknowledges what critics of central banks (including the Federal Reserve) have been complaining about for decades. Here are a couple tidbits from the article, with my comments in italics. — t.h.g. It is the bankers who have long dictated who would serve as Treasury Secretary, and most who have held that post had been top level bankers. Indeed, but then what? The corrupt global system of money, banking and finance cannot be reformed. It needs to be transcended. My book, The End of Money and the Future of Civilization, describes effective action that can be taken by individuals, businesses, governments, and NGOs to achieve that outcome. Even though it does not quite get to the root of the matter, this article is worth reading. THERE may not be a person in America without a strong opinion about what coulda, shoulda been done to prevent the underwear bomber from boarding that Christmas flight to Detroit. In the years since 9/11, we’ve all become counterterrorists. But in the 16 months since that other calamity in downtown New York — the crash precipitated by the 9/15 failure of Lehman Brothers — most of us are still ignorant about what Warren Buffett called the “financial weapons of mass destruction” that wrecked our economy. Fluent as we are in Al Qaeda and body scanners, when it comes to synthetic C.D.O.’s and credit-default swaps, not so much. The window for change is rapidly closing. Health care, Afghanistan and the terrorism panic may have exhausted Washington’s already limited capacity for heavy lifting, especially in an election year. The White House’s chief economic hand, Lawrence Summers, has repeatedly announced that “everybody agrees that the recession is over” — which is technically true from an economist’s perspective and certainly true on Wall Street, where bailed-out banks are reporting record profits and bonuses. The contrary voices of Americans who have lost pay, jobs, homes and savings are either patronized or drowned out entirely by a political system where the banking lobby rules in both parties and the revolving door between finance and government never stops spinning. It’s against this backdrop that this week’s long-awaited initial public hearings of the Financial Crisis Inquiry Commission are so critical. This is the bipartisan panel that Congress mandated last spring to investigate the still murky story of what happened in the meltdown. Phil Angelides, the former California treasurer who is the inquiry’s chairman, told me in interviews late last year that he has been busy deploying a tough investigative staff and will not allow the proceedings to devolve into a typical blue-ribbon Beltway exercise in toothless bloviation. He wants to examine the financial sector’s “greed, stupidity, hubris and outright corruption” — from traders on the ground to the board room. “It’s important that we deliver new information,” he said. “We can’t just rehash what we’ve known to date.” He understands that if he fails to make news or to tell the story in a way that is comprehensible and compelling enough to arouse Americans to demand action, Wall Street and Washington will both keep moving on, unchallenged and unchastened. Angelides gets it. But he has a tough act to follow: Ferdinand Pecora, the legendary prosecutor who served as chief counsel to the Senate committee that investigated the 1929 crash as F.D.R. took office. Pecora was a master of detail and drama. He riveted America even without the aid of television. His investigation led to indictments, jail sentences and, ultimately, key New Deal reforms — the creation of the Securities and Exchange Commission and the Glass-Steagall Act, designed to prevent the formation of banks too big to fail. As it happened, a major Pecora target was the chief executive of National City Bank, the institution that would grow up to be Citigroup. Among other transgressions, National City had repackaged bad Latin American debt as new securities that it then sold to easily suckered investors during the frenzied 1920s boom. Once disaster struck, the bank’s executives helped themselves to millions of dollars in interest-free loans. Yet their own employees had to keep ponying up salary deductions for decimated National City stock purchased at a heady precrash price. Rubin has never apologized, let alone been held accountable. But he’s hardly alone. Even after all the country has gone through, the titans who fueled the bubble are heedless. In last Sunday’s Times, Sandy Weill, the former chief executive who built Citigroup (and recruited Rubin to its ranks), gave a remarkable interview to Katrina Brooker blaming his own hand-picked successor, Charles Prince, for his bank’s implosion. Weill said he preferred to be remembered for his philanthropy. Good luck with that. Among his causes is Carnegie Hall, where he is chairman of the board. To see how far American capitalism has fallen, contrast Weill with the giant who built Carnegie Hall. Not only is Andrew Carnegie remembered for far more epic and generous philanthropy than Weill’s — some 1,600 public libraries, just for starters — but also for creating a steel empire that actually helped build America’s industrial infrastructure in the late 19th century. At Citi, Weill built little more than a bloated gambling casino. As Paul Volcker, the regrettably powerless chairman of Obama’s Economic Recovery Advisory Board, said recently, there is not “one shred of neutral evidence” that any financial innovation of the past 20 years has led to economic growth. Citi, that “innovative” banking supermarket, destroyed far more wealth than Weill can or will ever give away. Even now — despite its near-death experience, despite the departures of Weill, Prince and Rubin — Citi remains as imperious as it was before 9/15. Its current chairman, Richard Parsons, was one of three executives (along with Lloyd Blankfein of Goldman Sachs and John Mack of Morgan Stanley) who failed to show up at the mid-December White House meeting where President Obama implored bankers to increase lending. (The trio blamed fog for forcing them to participate by speakerphone, but the weather hadn’t grounded their peers or Amtrak.) Last week, ABC World News was also stiffed by Citi, which refused to answer questions about its latest round of outrageous credit card rate increases and instead e-mailed a statement blaming its customers for “not paying back their loans.” This from a bank that still owes taxpayers $25 billion of its $45 billion handout! If Citi, among the most egregious of Wall Street reprobates, feels it can get away with business as usual, it’s because it fears no retribution. And it got more good news last week. Now that Chris Dodd is vacating the Senate, his chairmanship of the Banking Committee may fall next year to Tim Johnson of South Dakota, home to Citi’s credit card operation. Johnson was the only Senate Democrat to vote against Congress’s recent bill policing credit card abuses. More daunting still is the inquiry’s duty to reach into high places in the public sector as well as the private. The mystery of exactly what happened as TARP fell into place in the fateful fall of 2008 thickens by the day — especially the behind-closed-door machinations surrounding the government rescue of A.I.G. and its counterparties. Last week, a Republican congressman, Darrell Issa of California, released e-mail showing that officials at the New York Fed, then led by Timothy Geithner, pressured A.I.G. to delay disclosing to the S.E.C. and the public the details on the billions of bailout dollars it was funneling to its trading partners. In this backdoor rescue, taxpayers unknowingly awarded banks like Goldman 100 cents on the dollar for their bets on mortgage-backed securities. Why was our money used to make these high-flying gamblers whole while ordinary Americans received no such beneficence? Nothing less than complete transparency will connect the dots. Among the big-name witnesses that the Angelides commission has called for next week is Goldman’s Blankfein. Geithner, Henry Paulson and Ben Bernanke should be next. If they all skate away yet again by deflecting blame or mouthing pro forma mea culpas, it will be a sign that this inquiry, like so many other promises of reform since 9/15, is likely to leave Wall Street’s status quo largely intact. That’s the ticking-bomb scenario that truly imperils us all. Frank Rich is an Op-Ed columnist for The New York Times.